A media event was held at Metro on Friday afternoon to celebrate two recent grants from the Federal Transit Administration: $25 million for the purchase of about 60 new compressed natural gas-powered buses and $9.6 million for a new Silver Line station at Patsaouras Plaza at Union Station. The grant for the bus platform was the largest FTA Livability Grant Initiative in the nation. And the bus grant was fourth largest State of Good Repair grant. Both awards come on the heels of last year’s $47.7 million State of Good Repair Grant from the FTA to help pay for the new Bus Division 13 building adjacent to Metro headquarters. All good signs that Metro is staying competitive when competing for federal dollars. FTA Deputy Administrator Therese McMillan and Los Angeles Mayor and Metro Board Chair Antonio Villaraigosa came together at the event and also called upon Congress to pass the American Jobs Act, which includes billions of dollars for infrastructure improvements across the U.S.
McMillan said that the Act would provide about $400 million to California transit agencies for bus repair and about $1 billion statewide for transportation projects. “There are too many people out there hurting for us to do nothing,” she added. The new bus division, the Silver Line station — as part of Metro’s ExpressLanes project — and the new CNG buses are expected to create more than 5,000 jobs directly and indirectly, according to Metro’s estimates. The news release from the FTA is after the jump. LOS ANGELES – People living and visiting the Los Angeles area will soon have improved transit options and reduced congestion thanks to $34.7 million from the Federal Transit Administration’s (FTA) 2011 Bus Livability and State of Good Repair competitive discretionary programs. FTA Deputy Administrator Therese McMillan was at Metro headquarters in Los Angeles today to make the announcement and to encourage Congress to support the transportation investments proposed under President Obama’s American Jobs Act. She was joined by Los Angeles Mayor Antonio Villaraigosa, Metro CEO Art Leahy and other officials. The U.S. Senate is expected to vote on the transportation proposals made under the President’s American Jobs Act next week. 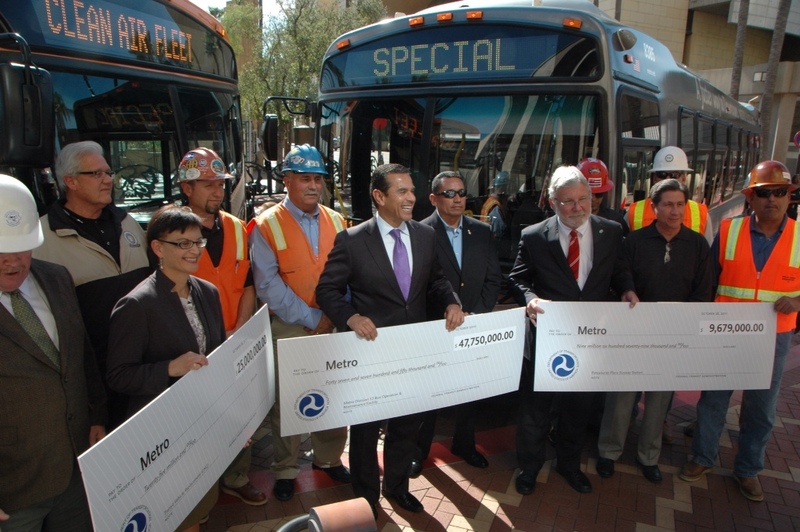 The transit grants announced today will help Metro purchase new energy-efficient compressed natural gas buses and construct a new Patsaouras Plaza Bus Station adjacent to Union Station in downtown Los Angeles, which will serve El Monte Busway passengers and other transit riders. The improved station will connect directly to Union Station, Los Angeles’ main passenger rail station, and provide more convenient connections between other bus lines, light rail, Amtrak and Metrolink commuter rail. The project is part of the Metro ExpressLanes Demonstration Program, a larger strategic effort to reduce traffic congestion along the I-10 and I-110 freeways in Los Angeles County. The demonstration program, a partnership between the U.S. Department of Transportation, Metro and the California Department of Transportation (Caltrans), is currently under construction and expected to generate 2,400 jobs, thanks in part to a $210 million federal grant awarded by the Department of Transportation four years ago. The grants announced today are included among more than 300 competitive discretionary grants totaling nearly $930 million announced nationwide earlier this month by Secretary LaHood and FTA Administrator Peter Rogoff to rebuild and renovate America’s transit infrastructure and plan for the future. FTA is providing more than $126 million for 41 projects in California. A complete list of successful project proposals can be found at http://fta.dot.gov/grants/13094.html. FTA reviewed 839 project applications representing $4.9 billion in funding requests from transit providers across the country for the fiscal year 2011 competitive discretionary grant programs. Passing the American Jobs Act would help many more qualified projects to be funded, and create tens of thousands more jobs. I saw that the Silver line will get signal precedence through downtown. Could using the new station, plus the western tail of the El Monte busway, plus the signal precedence be used to get LAX Flyaway buses into and out of downtown more rapidly? The Flyaway works great except at the ends… going around LAX and stopping every block it becomes a tortoise. Also, from the end of the Harbor Busway into Union station, it drives at the mercy of rush hour. Add in Silver line improvements at the downtown end, and the Green Line people mover to get people from curbside to a central station at the LAX end, and you’d have a fast ride…. How about BUILDING BUS SHELTERS FOR THE SILVER LINE IN DOWNTOWN???????? Half of the stations DO NOT HAVE BENCHES AND PASSENGERS NEED TO WAIT 60 MINUTES FOR A SILVER LINE BUS!!!!!!!!!!!! PLEASE FIX! i is about time that mta gets help to make need inproment to it fleet and to union station and to the silver line. every single bus stop in L.A.
should have at least one bench, In Sylmar on Roxford Street I got so sick of it, I spent my own bucks at Kmart and bought a 3 seater wood bench ( only $6.00 ) and chained it to the pole. Like 4 years ago, and its still there, and used by all. How much as a taxpayer would you be willing to pay for bus shelters at every bus stop? Sales tax to 20%? Bus fares to $5.00 per ride? Anything is possible; it’s just the matter of how much you’ll be willing to pay. You need to start realizing that nothing is free in this world; everything costs money. Unfortunately, the reality is that LACMTA has no money for this nor have the budget needed to maintain said bus shelters. You can build a bus shelter, but that’s not the end of the cost. You need people to maintain the upkeep of said shelters from trash, cigarette butts, vandalism, sticky gum, soda splashes, changing light bulbs, safety from transients, etc. All of that costs money. Imagine what the cost will be every year to do that throughout every single LACMTA bus stop? Who’s going to pay for that? You need to look past Metro on this one. Bus Benches are controlled by the city.